Warm, witty, and wise, Go On, Girl dramatizes the dilemmas of life in the suburbs and the bonds shared by women. Perfect for fans of Class Mom and Big Little Lies. This is a perfect family humor that I have read recently. Sydney is a working mom and a parent of little girl Amanda who is a first grader in Forest River Elementary school. While she is busy managing work and office, her life takes a turn when she becomes treasurer in Forest River school PTA. The office work, PTO meetings, work related to PTO, gossips, and warnings of other PTO moms drive Sydney crazy. As luck would have it, she and her husband Craig have to deal with the pressure of selling their home and preparing to move to a new place at the same time. Even though Syd joins the PTA committee reluctantly, she makes great friends. She goes beyond the initial judgments and forms a friendship with Jackie. Her straightforward nature and the cool way of handling problems make her a good friend to Jackie. The story, dialogues, and narration are all witty. Craig is a sweet as an understanding partner to Syd. I thoroughly enjoyed reading the book even though it is not a thriller and has a predictable story. I fell in love with Syd and could relate to her anxiety when it came to taking a decision for her daughter. We all go through pressure when things move fast in our life and we have to take some important decisions. But, we never look back and see how these circumstances help us to find real friends and form great bonds in our life. In all this process while Syd forms new friends, especially Jackie, Kara and Rosemary, Craig gels well with Andrew. This is a fantastic read for a beach vacation or long drives. If you are a mom of Elementary school child, you would surely love this! PS: I have received this free book from the author in exchange for a review and this is my honest opinion of the book. 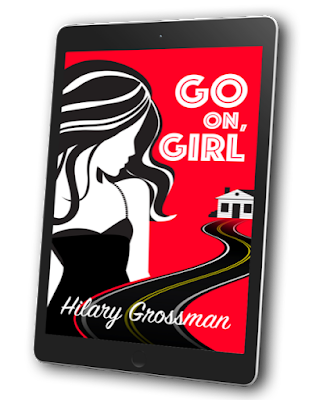 By day, Hilary Grossman works in the booze biz. By night she hangs out with her "characters." She has an unhealthy addiction to denim and high heel shoes. She's been known to walk into walls and fall up stairs. She only eats spicy foods and is obsessed with her cat, Lucy. She loves to find humor in everyday life. She likens life to a game of dodge ball - she tries to keep many balls in the air before they smack her in the face. She lives on Long Island.